I started my afternoon with every intention to work on sketching circles. It was one of the afternoons when an aide took the responsibility for my mother, so I packed a bag with a sketch book, pencils, pens, crayons, water colors, and my camera, and headed for the nearest coffee shop where I fully intended to sit and sip coffee and draw circles all afternoon. 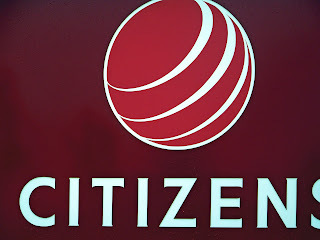 On the way to the coffee shop, I made a couple stops and took some photos of circles. 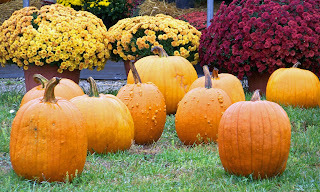 These pumpkins and mums are for sale on the lawn part of our nearest strip mall, and would make nice subjects for rugs. 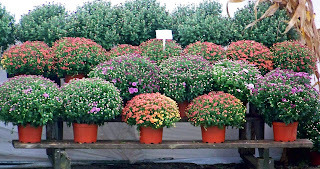 I thought the mums and pumpkins made great circles - and elipses, which I think are just stretched out circles. 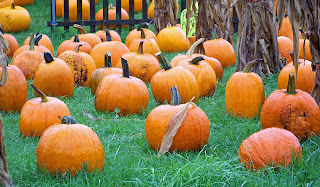 These pumpkins were the smallest ones, all piled on some bales of straw. Circles bumping into circles. These flowers almost make the series of circles that would be warm-up circles once I start drawing. After the pumpkins, I reached an office that used to house my attorney, but now is a real estate office - and I thought how effective a nice black beauty line around a circular hooked rug would be. 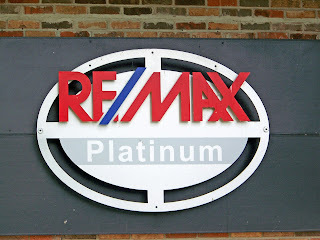 This sign is on the little drive-up bank kiosk - nice way to turn a circle into a globe. Finally got to the coffee shop, which is in a red brick building with some nice extra architectural details, like this elipse. 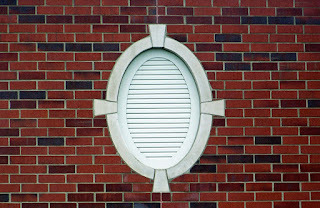 I not only think this circle pattern might be useful someday, but I also really like the bricks. Next time I hook bricks I want to remember to have some black bricks in with the red. Later in the day, I went to the farm and found a few circles. 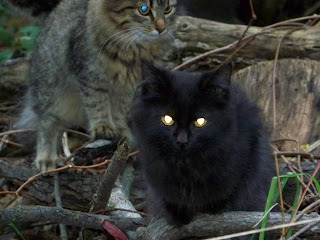 Those cat eyes are certainly round, as are the cat heads and bodies. This wheel is from my gold Schwinn bicycle with 3 gears - the first thing I bought with money I earned on my first job while I was in high school. 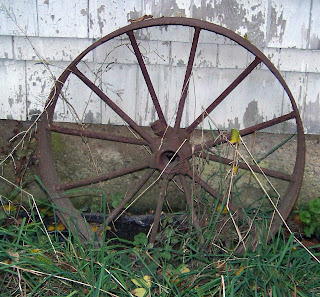 I kept it forever until a man I hired to clean the yard threw it away, but strangely kept the wheels to hang on the side of the barn. 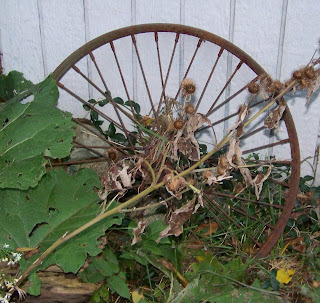 This wheel is from an old farm implement (probably a horse drawn manure spreader) that used to reside in my orchard. There used to be two of them, but someone took a liking to the other one and removed it from my gatepost. I had great fun collecting circles but never got around to the sketching because I bought a boat. My first warm-up exercise at the cafe was to read a newspaper with my coffee and that's when I saw an ad for a rowboat in the classifieds. The boat I bought earlier in the summer hasn't worked out very well, it's really just too heavy and the motor is too complicated for me to use easily - so, I called the number in the ad, learned the boat is aluminum, and drove right over to see it. It's light weight enough that the ninety year old gentleman who was selling it could lift it by himself - of course, he's in pretty fit shape. If he hadn't told me he'd been married for 61 years, I would have guessed he was about 70. The boat was his wife's and he lost her 16 months ago. They lived all those years on a summer camp for poor city children. The camp sits on the edge of a good fishing lake, and I now have permission to take the boat back over there and fish in that lake. The camp, his home, is on a dirt road that brings back wonderful memories for me. Many years ago, I used to ride horses on that road. It was just a sandy track back then with hardly any traffic and we used to gallop up and down like it was a race track. That's where I rode my favorite horse, my Morgan stallion Tara. This new boat will be easy to handle, easy to transport in the back of my truck, so I can take it to any nearby lake, but I think I'll try out Mr. Witte's fishing lake first. So, anyway, I never did get to my sketching assignment, from Heidi Wulfraat's Sketching rug camp, I went to a boat camp instead. It sounds like you had a wonderful day. I love all of your circle pictures. I have noticed that since I began rug hooking a couple of years ago, I look at everyday objects diffently - always looking to see if there is a rug somewhere! 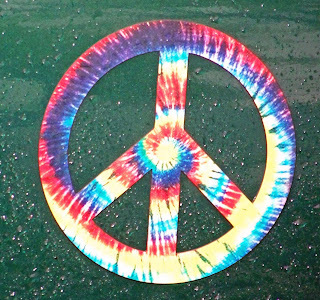 Isn't it fun, the way rug hooking effects so many things? I like this. I have been thinking about taking series of pictures with a shape theme!